The anterior intercostal arteries arise as lateral divisions from the internal thoracic arteries either directly or indirectly. Anterior intercostal arteries which circulate the upper six intercostal spaces emerge as lateral branches from the internal thoracic artery, while those circulating towards the lower spaces arise via the musculophrenic artery. One travels under the margin of the upper rib. 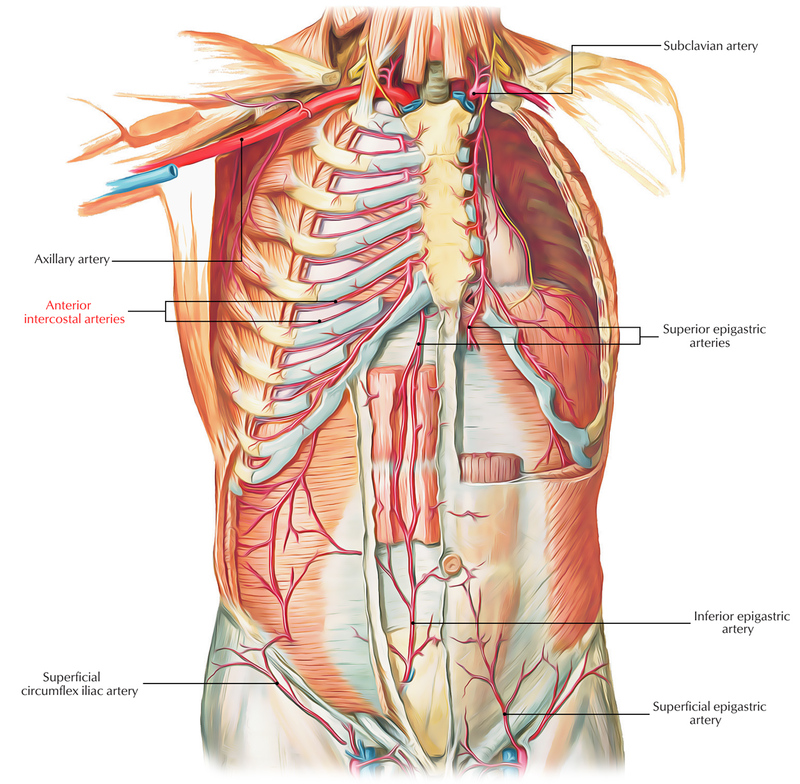 The other goes over the boundary of the lower rib and connects with a collateral branch of the posterior intercostal artery. The distributions of the anterior and posterior intercostal vessels overlap and can develop anastomotic connections. The anterior intercostal arteries are generally smaller than the posterior vessels. Along with anterior intercostal arteries and various other branches, the internal thoracic arteries produces perforating branches that travel directly forward among the costal cartilages in order to supply structures external to the thoracic wall. These vessels travel together along with the anterior cutaneous branches of the intercostal nerves. The anterior intercostal arteries supply the muscles and skin inside the intercostal spaces along with the parietal pleura together with the posterior intercostal arteries.